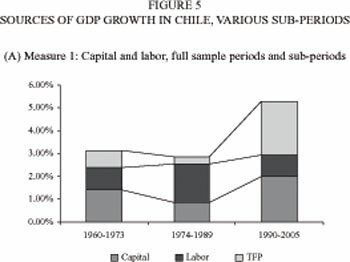 Chile has exhibited sharp cyclical and trend variation in its GDP and TFP growth rates during the last half century. This paper presents new estimates of the sources of Chile's growth and new measures for factor inputs and TFP during 1960-2005. Capital series are adjusted by utilization and labor employment series by hours worked and labor quality measures. Using a Cobb-Douglas function, the paper presents eight series for TFP based on alternative combinations of input measures. Three alternative cyclical measures for GDP suggest that the full period can be divided into three sub-periods of similar length, with similar cyclical features, and that coincide closely with distinct historical eras: 1960-1973, 1974-1989, and 1990-2005. Across the latter time spans, a negative relation between the first and second moments of GDP growth is confirmed, consistent with international experience. 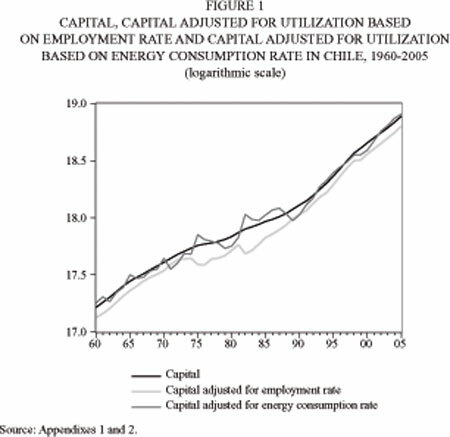 This paper also reports econometric evidence on the behavior of Chile's TFP during 1960-2005. TFP dynamics are shaped by cyclical variables (the terms of trade and real exchange rate undervaluation) and structural policy variables (macroeconomic stabilization and microeconomic reform progress), as well as positive interaction effects between macro performance and micro policies. Keywords: Economic Growth, Growth Accounting, TFP Dynamics. Nearly half a century ago, Solow (1957) developed a method for decomposing economic growth based on the contribution of the primary factors of production (capital and labor) and the efficiency with which they are used. This allows decomposing the sources of growth into a "perspiration" component, corresponding to factor accumulation, and an "inspiration" component, corresponding to productivity gains. The latter component can lead to sustained higher GDP growth; hence measuring productivity growth is important.1 At the same time, good institutions, combined with good policies, should encourage inspiration in a country and thus lead to sustained growth, a hypothesis that is explored in this paper. The Chilean economy has gone through major changes in its growth pattern and the contribution of growth factors in the last decades, as documented in earlier studies (for example, Loayza and Soto, 2002). Total sector productivity TFP growth has observed strong fluctuations, both in trends and along business cycles. GDP and TFP growth rates were very high in Chile during the "golden years" of 1986-1997, falling to more moderate rates since 1998 (Gallego and Loayza, 2002). Are the earlier estimates robust to longer data series and alternative measures of capital and labor, in comparison to previous studies? 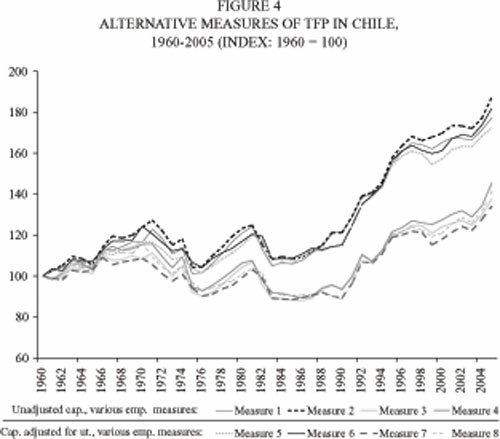 What explains the behavior of TFP in Chile from 1960 to the present? This paper aims at addressing the two latter questions. First, we present new estimates of the sources of Chile's growth and new measures for factor inputs and TFP (sections 2 and 3). Capital series are adjusted by utilization and labor employment series by hours worked and labor quality measures. Using a Cobb-Douglas function, we identify the contribution of factor inputs and obtain residual TFP series. This work is part of the empirical literature on growth and TFP measures for Chile.2 However, in this paper we expand on previous research along two dimensions. We extend the time coverage by using annual data for the period 1960-2005 and we make use of a larger variety of capital and labor series, giving rise to eight alternative measures for the residual TFP series. There is scant research on the determinants of TFP for Chile. Therefore we analyze the dynamics of TFP in Chile in section 4. We specify and estimate a parsimonious model for TFP, based on cyclical variables and structural policy determinants that help in explaining the short-run and trend behavior of the economy's aggregate efficiency during the last half century. The paper closes with the main conclusions drawn in section 5. Appendix 1 presents data definitions and sources and appendix 2 reports the new 1960-2005 data series that are generated and used in this paper. This section presents different measures of Chile's stock of capital, labor input and TFP. These measures include adjustments for utilization and input quality, using annual data covering the 1960-2005 period. Our basic measure of aggregate capital is the stock of physical capital, the sum of investment in machinery and equipment and in buildings and construction. This primary measure does neither reflect changes in capital utilization rate during the business cycle nor take into account changes in the quality of capital. When capital is not adjusted for quality, the variations in capital quality are residually attributed to changes in TFP. To avoid this problem, several authors use the capital quality index proposed by Jorgenson and Griliches (1967), based on a weighted average of investment in machinery/equipment and buildings/construction, where the weights are determined by the relative rates of return on the corresponding investment categories. Greenwood and Jovanovic (2000) provide an alternative measure of capital quality, based on the evolution of the relative price of investment to consumption. 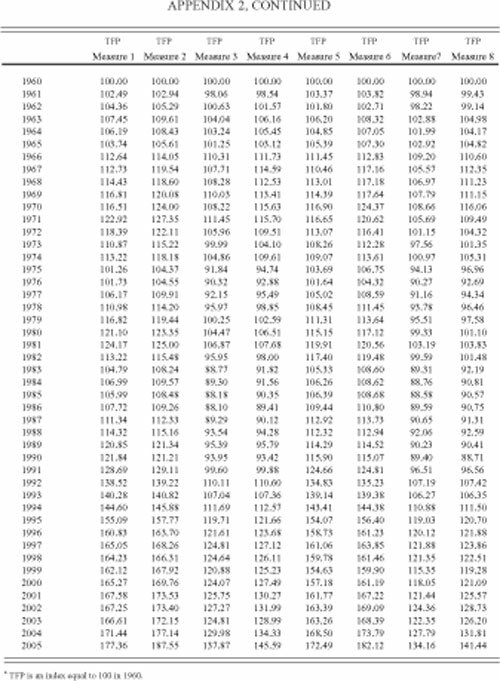 We have computed both indexes for the period 1960-2005. We found that capital quality in 2005 is close to the level in 1960, which suggests serious measurement problems. Considering this result and the absence of other adequate quality indexes for Chile, we decided not to adjust capital for quality. Thus all our residual measures for TFP also reflect changes in capital quality. Not adjusting for capital utilization can lead to errors in measuring TFP along the business cycle, as changes in the use of the physical capital stock are attributed to TFP. If we assume that capital and labor have a relatively similar rate of utilization, we can take the labor unemployment rate as a relevant proxy of the capital utilization rate. However, a drawback of this approach is that it assumes strong complementarity of capital and labor along the cycle. Costello (1993) proposes an alternative measure of capital input: electricity consumption. In contrast to using labor utilization, the latter approach has the advantage of being based on an independent measure, but it does not consider plausible substitution between electricity and other sources of energy. We use the information on energy consumption, instead of only electricity, to compute a new measure of the degree of capital utilization: the deviation of the actual energy consumption series from its long-term trend, based on a Hodrick-Prescott filter estimate. By multiplying the gross capital stock by one minus the deviation, we obtain a new capital series that adjusts for the degree of utilization. 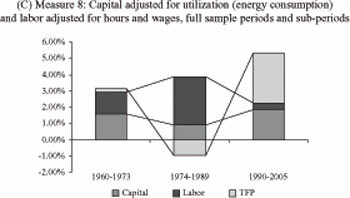 Figure 1 depicts the evolution of the three alternative capital series for the 1960-2005 period: gross capital, capital adjusted for employment rate and capital adjusted for energy consumption rate. The three measures of capital follow a similar pattern, although the capital series adjusted for utilization using energy consumption is more volatile than the other two series. The definitions and sources of the variables -for capital and all other series used in this paper- are summarized in Appendix 1. Appendix 2 reports the new data series spanning 1960-2005. The high correlation between the three series over the 46 years of our sample -which combines the cyclical and trend correlation- is reflected in Panel A of Table 1. The correlations for variables in levels are very high, ranging from 0.995 to 0.997. The correlations in Panel B (growth rates of variables) are considerably lower, reflecting the strong trend component of all three series. Our basic labor employment measure is the number of workers employed in the economy. Our first adjustment to this measure is to correct for the average number of hours worked per week. We then adjust employment for labor quality, using two different methods. The first is based on average years of workforce schooling. The second draws on an index of work quality developed by Jorgenson and Griliches (1967), based on relative wages to weigh labor quality according to labor productivity associated to the acquisition of human capital. The latter index has an advantage over the adjustment based on years of schooling because it reflects labor productivity validated by labor markets. Figure 2 shows the series for employment, hours worked, years of schooling, and wage-based labor quality during 1960-2005. With the exception of hours worked, all series present a positive trend and similar cyclical behavior. Table 2 reports the correlations between our four employment series studied: employment, employment adjusted for hours worked, employment adjusted for hours worked and years of schooling, and employment adjusted for hours worked and labor quality. 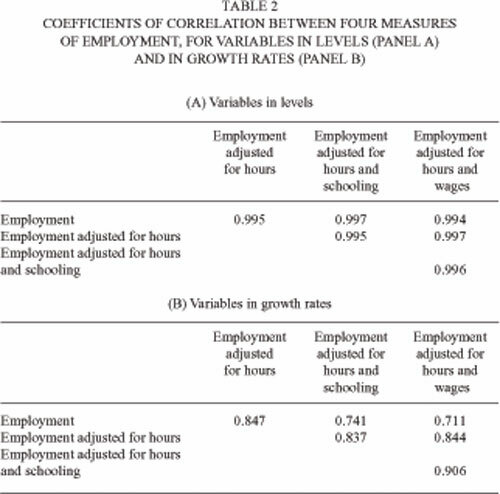 Panel A reflects high correlations between the four employment series, for variables in levels (all above 0.99). In Panel B, for variables in growth rates, the correlations among the four variables continue to be high (ranging from 0.71 to 0.91). Chile's GDP grew by an annual average rate of 3.89% during 1960-2005. This long-term growth pattern exhibits strong cyclical and trend variations (see Panel A, Figure 3). In order to identify trend growth in relevant sub-periods, we proceed to isolate the business cycles effect applying three standard methods. First, we use the employment series, with business cycle measured by the percentage difference between the corresponding year's actual employment rate and the average employment rate in the full 1960-2005 period (9.04%). For the second and third method we apply the Hodrick-Prescott (HK) and Baxter-King (BK) filters to the GDP series to derive the percentage difference between actual and trend GDP in levels. 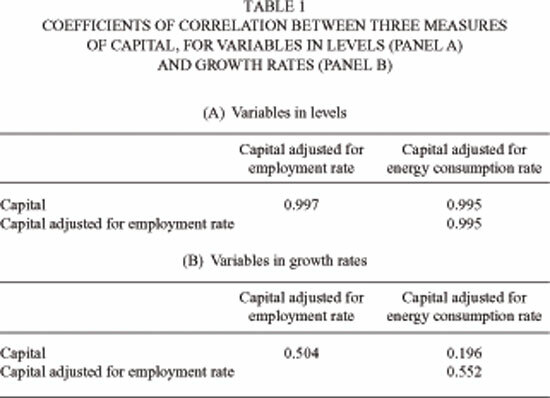 The filtered GDP series are depicted in Panel A of Figure 3, while Panel B shows the cyclical measure based on employment and the two cycle measures of the applied GDP filters. The correlations between the cyclical measure based on employment and the two cyclical measures based on the trend GDP are presented in Table 3. The correlations between the employment cycle measure based on employment and both cyclical measures based on GDP trends are close to 0.6, while the correlation between the two cyclical measures based on output is considerably higher, at 0.9, as expected. 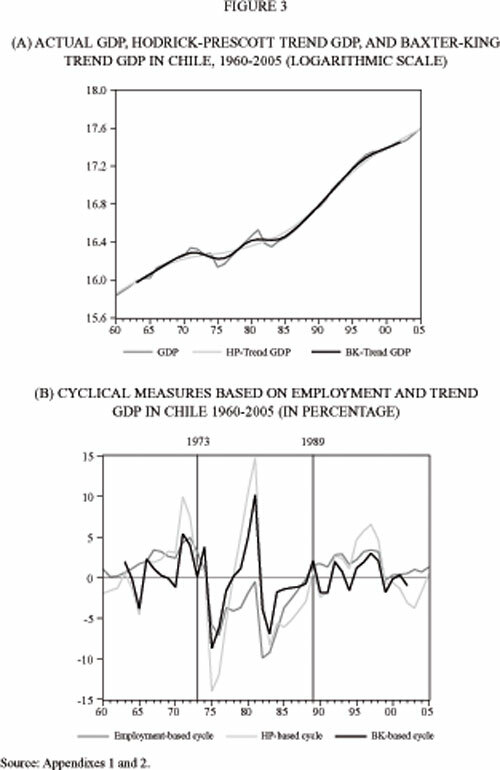 The three cyclical measures (Figure 3, Panel B) suggest that the full 46-year period can be divided into three sub-periods of similar length and with similar cyclical features, separated by those years when both employment and GDP levels were close to their trend levels: 1973 and 1989.3 The resulting three periods -1960-1973, 1974-1989 and 1990-2005- are of similar length and roughly coincide with distinct historical eras that differ strongly in terms of international, economic, and political conditions. In this sense, the "golden years" (1986-1997) are not a useful reference period, because they start in a bust year and end in a boom year, thus reflecting a strong cyclical recovery. Table 4 reports Chile's average GDP growth rates and their standard deviations for the sub-periods that we have identified as relevant, cyclically-adjusted growth periods. The data reflects the following stylized facts. First, the sub-period with the lowest average growth rate (1974-1989) also exhibits the highest volatility. Second, the opposite can be said about the 1990-2005 period. These results confirm the international finding that first and second growth moments are negatively correlated (Ramey and Ramey, 1995). Finally, dividing the third sub-period (1990-2005) in two highlights the significant drop in the growth rate in 1998-2005 relative to 1990-1997, although volatility also slightly decreased. where the hat represents percent changes. The only parameter required to apply the above method is capital share a. Using national account data from the Central Bank of Chile, we obtain an average share of capital in national income for the 1960-2005 period of 50%. This measure is biased upward, however, because it includes the income share of independent workers. Information from the Universidad of Chile Survey indicates that around 20% of workers in Chile are independent workers. Subtracting independent-workers' income from the national account figure yields a final capital share of 40%. This figure is consistent with international evidence and with previous estimates for Chile obtained from production function estimations (e.g. Roldós, 1997). We carried out a sensitivity analysis using different values of this parameter, and the results were qualitatively similar to those reported below. 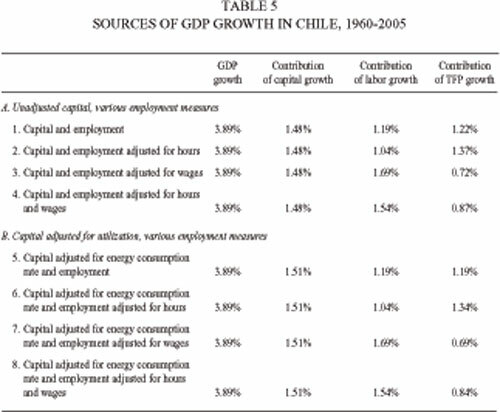 The average annual contribution of (unadjusted) physical capital to Chilean growth in 1960-2005 was 1.48% (that is, the 40% capital share times the 3.7% average growth rate of capital), as reflected in measures 1-4 in Table 5. When we use the alternative measure that corrects for the rate of capital utilization (using the energy consumption rate as a proxy for utilization), the estimated contribution of capital to growth increases slightly to 1.51%, as reflected in measures 5-8 of Table 5. The average annual contribution of unadjusted labor to growth was 1.19% (the 60% share times the average 1.98% growth rate of employment), as reflected in measures 1 and 5. When adjusted for hours worked, the contribution of employment declines to 1.04%, due to the reduction in weekly work hours from 50.4 in 1960 to 45.3 hours in 2005. When adjusted for labor quality, the contribution of employment to growth increases approximately by 0.5 percentage points, which reflects the 0.82% average growth in labor quality between 1960 and 2005. The contribution of the different measures of capital and employment to growth in Chile are reflected with opposite sign into the residual estimations of TFP growth. For the conventional measures of unadjusted capital and labor contributions (measure 1), average annual TFP growth attained 1.22%; this estimate declines marginally, to 1.19%, when we correct for capital utilization (measure 5). When we adjust for labor quality, annual TFP growth falls to 0.72% (measure 3) or 0.69% (measure 7). By excluding labor quality improvements, the two latter measures of TFP growth reflect only changes in the quality of capital and other gains in production efficiency that are not captured by increases in relative wages of better educated labor. Consequently, these measures of TFP growth rates are not comparable to the previous measures, without adjustment for labor quality. Measures 4 and 8 show an average annual TFP growth of 0.87% and 0.84% respectively. These figures are higher than the ones for measures 3 and 7 due to the reduction in weekly work hours between 1960 and 2005. 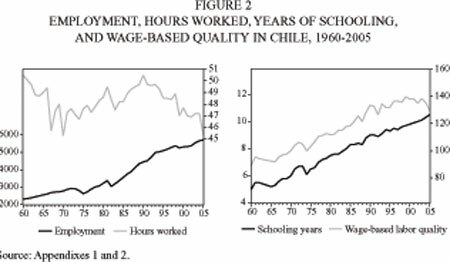 We conclude that most of average growth in Chile, in the 1960-2005 period, reflected the accumulation of productive factors, while "inspiration" or efficiency gains have only played a secondary role. Without adjustment for labor quality, TFP growth contributed 1.2% of the 3.9% GDP growth, representing a relative contribution of 31% to Chile's growth. This share falls to a range of 17-19% when adjusting for labor quality, the contribution of overall efficiency gains shrinks to 0.85% representing only 18% of aggregate growth. Chile's growth experience confirms that moderate GDP growth is strongly associated to moderate efficiency gains. This is in line with international evidence that shows that high aggregate growth is normally associated to high TFP growth. 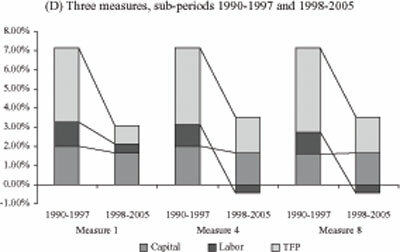 Figure 4 depicts our eight annual TFP measures confirming two clusters of TFP series, those derived from employment without labor quality adjustments (measures 1, 2, 5 and 6) and those based on quality-adjusted labor (measures 3, 4, 7 and 8). The figure also suggests the high correlation among the eight measures of TFP. Finally, the TFP series exhibit strong pro-cyclical behavior. For the following analysis, we focus on three estimates of TFP. The first estimate is measure 1, based on unadjusted capital and labor. The strength lies in being the conventional TFP measure derived in most previous empirical work. While this measure is the least preferred by us, it serves as a point of reference. We select the next two TFP estimates (measures 4 and 8) to reflect employment adjusted by hours and labor quality (measure 4) and, in addition, capital adjusted by utilization (measure 8). Table 6 reports the sources of growth for our three selected factor measures and TFP estimates, separately for each our three cyclically-defined sub-periods. Figure 5 depicts the corresponding decompositions. The reported evidence points toward significant differences between the sub-periods under study. The 1960-1973 period is characterized by modest GDP and TFP growth. Capital accumulation made the most important relative contribution to Chilean growth, while labor growth contributes less than capital. This changes radically in the following period, 1974-1989, when GDP growth is even more modest. Now labor growth represents the dominant contribution. When adjusting for labor quality, labor explains all GDP growth during this period. TFP growth collapses to attain only slightly positive or larger negative rates, depending on its measure. A dramatic turnaround of growth and its contributing factors is observed in the third period, 1990-2005. The contribution of capital to this period's high growth is very substantial, dwarfing capital's contribution during the preceding decades. In contrast, employment contributed little to growth, particularly when considering employment adjusted by hours and wages. The contribution of TFP is particularly impressive after 1989, when TFP growth attains levels that are unprecedented in recent economic history, varying from 2.4% to 3.1%. Now let's focus more closely on the high-growth sub-period 1990-2005 and its two halves: the 1990-1997 years of very high growth that coincide with a long phase of cyclical expansion and the subsequent 1998-2005 years of more moderate and volatile growth (see Figure 5D). The decline in average GDP growth from 7.14% in 1990-1997 to 3.08% in 1998-2005 was accompanied by an insignificant decline in the contribution of capital and a massive fall in the contribution of labor. We also observe a very significant drop in the contribution of TFP growth, from a range of 3.9% to 4.4% in 1990-1997 to a much lower range of 1.0% to 1.9% in 1998-2005. However, the latter 1998-2005 period hides very distinct shorter time spans of common GDP and TFP performance: a sharp cyclical contraction in 1998-1999, a slow cyclical recovery in 2000-2003, and a strong recovery toward full employment in 2004-2005 (see Figure 3). TFP growth is particularly strong during the two last sample years (see the data on TFP in Appendix 2), a performance that is largely a result of favorable cyclical conditions, identified in the following section. The large swings in Chile's TFP growth, documented in the preceding sections, lead us now to undertake a more systematic search for it causes. Good or bad policies that introduce or eliminate distortions probably contribute to the economy's aggregate efficiency, thereby affecting aggregate output.5 Therefore, we expect that variables that represent the quality of economic policies (like macroeconomic stability and structural reform progress) and/or institutions (reflected in indicators such as civil liberties) that affect the agents' behavior should be considered among the structural determinants of the economy's aggregate efficiency. Furthermore, policy complementarities could be key to understanding why certain structural reforms or stabilization programs have positively affected TFP growth while others have not. Our regression analysis is performed for two TFP estimates described in the previous section: measure 4 (with capital and labor adjusted for hours worked and wage-based labor quality), and measure 8 (with capital adjusted for utilization based on the energy consumption rate, and labor adjusted for hours worked and wage-based labor quality). We do not use measure 1 as we know beforehand that it is an imperfect measure of TFP. The specification for the TFP level includes as determinants -in addition to cyclical variables as the terms of trade and the degree of exchange rate undervaluation (both with an expected positive sign)- an indicator of the overall status of structural reforms (with an expected positive sign), an indicator of macroeconomic instability, measured as the inflation rate divided by one plus the inflation rate7 (with an expected negative sign), and an indicator of civil liberties (with an expected positive sign). Appendix 1 describes data sources and variables measurement. Other variables not included could also be important determinants of productivity. An example is technological innovation. However, we do not have time series for this variable in Chile as well as data for other potential TFP determinants, which limits severally our empirical results. We also control for the potential interaction between macroeconomic instability and structural reform progress. This interaction variable captures the idea of policy complementary (Gallego and Loayza, 2002), applied here to a potential interaction between macroeconomic and structural policies. Hence, we expect structural reforms to have a stronger effect on aggregate economic efficiency under conditions of greater macroeconomic stability. Paripassu, government efforts to stabilize the macroeconomy should have larger effects when the economy suffers from fewer distortions as a result of better structural policies. Figure 6 depicts the evolution of the six potential determinants of TFP during 1960-2005. The figure reflects the structural reduction in the country's terms of trade that took place in 1975 and its large volatility before and after 1975. Huge real exchange misalignments were observed during the 1970s and early 1980s; comparatively the RER exhibits lower deviations from fundamentals since the late 1980s.8 Civil liberties deteriorated massively during 1973-1986, improved significantly in the late 1980s. Since 2002 the levels observed are the same as the 1960 levels. Macroeconomic instability deteriorated in the 1970s and recovered gradually since 1978, with the subsequent reduction in inflation, reaching low and stationary levels since 2001. Structural reforms deteriorated in the early 1970s, but they recovered aggressively until 1980 and more gradually during the two subsequent decades. where L is the lag operator, W(L) and Q(L) are lag polynomials, and X is the vector of explanatory variables presented in figure 6. The estimation strategy of equation (5) follows the general-to-particular approach (Hendry, 1995). Since the dynamic structure in the relation between TFP and the explanatory variables is unknown, we estimate an equation using contemporary and lagged values of the independent variables and lagged values of the dependent variable (the logarithm of the TFP index, ln(TFP)). We then proceed to simplify the equation until finding a parsimonious representation of the relationship that does not lose information compared to the general model. The final model is contrasted against the more general model that includes all lagged variables using a likelihood ratio test. In all cases the null hypothesis that the more parsimonious model is valid cannot be rejected at conventional significance levels. The estimation results are reported in Table 7. TFP exhibits significant inertia, as reflected by the significant and large coefficients of its own lags. However, an F-test strongly rejects the null hypothesis that all parameter values, except those of lagged dependent variables, are equal to zero. The effect of the business cycle on TFP captured by the terms of trade and the real exchange rate undervaluation shows in both cases the expected positive sign and is economically important. However, while terms of trade have a contemporaneous effect on TFP, the RER undervaluation acts with a lag. An index of civil liberties is the first institution-related variable included in the regression. This variable shows some short-term impact that with measure 4 (column 1) is positive and with measure 8 (column 2) is negative. However in both cases the long-term effect is equal to zero. Microeconomic policies have a large contemporaneous impact on TFP, which is reduced somewhat by the counter effects of the lags of microeconomic policies. 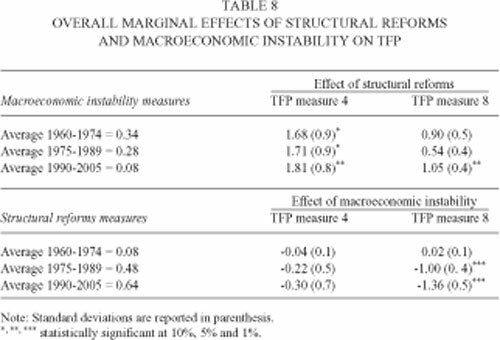 We also find evidence of a significant interactive effect between structural policies and macroeconomic instability: better microeconomic policies have a much higher impact on TFP under conditions of macroeconomic stability (low inflation). There is no evidence that macroeconomic instability has direct effects on TFP in the estimation of model with measure 4, once we take into account the interaction with microeconomic policies, but there is such evidence in the model with measure 8.
where b0 is the coefficient of the SR in the equation of TFP and b1 is the interaction coefficient, a0 is the coefficient of macroeconomic instability, and a1 corresponds to the interaction coefficient. The two sets of results (in columns 1 and 2) illustrate the complementarity of structural reforms and macroeconomic stabilization. For example, the 1960-1974 period featured high inflation, as reflected in a macroeconomic instability figure of 0.34, while the combined long-term coefficient of structural reforms is only 1.7 (measure 4). On the other hand, under the low inflation conditions observed in the sub-period 1990-2005, reflected in a macroeconomic instability coefficient of 0.076, the combined long-term coefficient of structural policies reaches 1.81. Thus, an increase in the structural reforms index of 5 percentage points (which is equivalent to the increase in the index between 1990 and 1994) contributes to a long-term increase of the TFP level of almost 8.4% in 1960-1974, 8.6% in 1975-1989, and 9.0% in 1990-2005, according to measure 4 estimates. Under measure 8, the results for each period are smaller but the differences among periods are larger. An increase in the structural reform index of 5 percentage point will induce a long-term increase in TFP of 1.9%, 2.7% and 5.3% for each one of the periods, respectively. Therefore, structural reforms had a substantially smaller effect (which could even be zero) in the case of very high macroeconomic instability (1960-1974). Although the results of both columns differ because the dependent variable is measured differently, they demonstrate that the two explanatory variables are complementary. 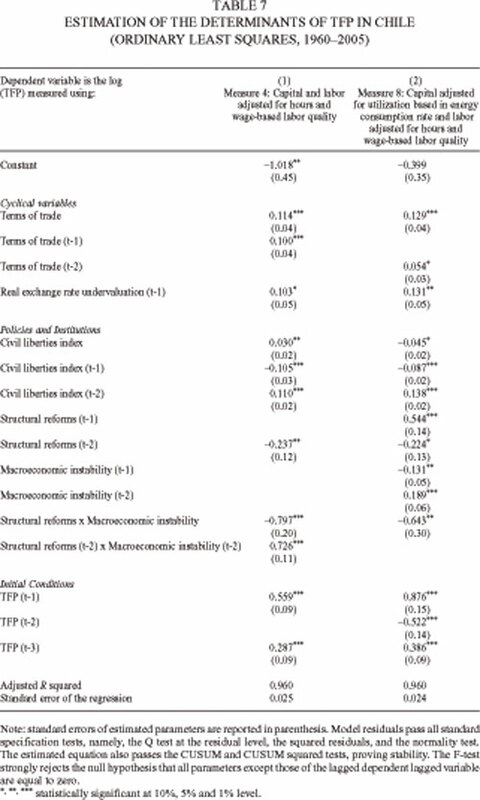 Analogous results are reported in Table 8 to quantify the effects of the reduction in macroeconomic instability, conditional on different levels of structural reform progress. Macroeconomic instability has its biggest impact in the most recent period, when the structural reform progress index is highest (1990-2005): the long-term coefficient is -0.30 (measure 4), which is much larger than the impact of stabilization under conditions of larger microeconomic distortions in 1960-1974. Reducing the macroeconomic instability index by 10 percentage points raises the long-term TFP level by 0.4% in 1960-1974, 2.2% in 1975-1989, and 3% in 1990-2005 (measure 4). The long-run effect of macro-instability changes when measure 8 is used. For the first period, for example, the effect on TFP would be zero. With reforms at the average level for 1975-1989, the effect of macroeconomic instability is one-to-one with inflation-reduction efforts. In this case, when structural reforms are more advanced, we observe an important effect of macroeconomic stabilization. We observe again complementarity among structural reforms and macroeconomic stability. 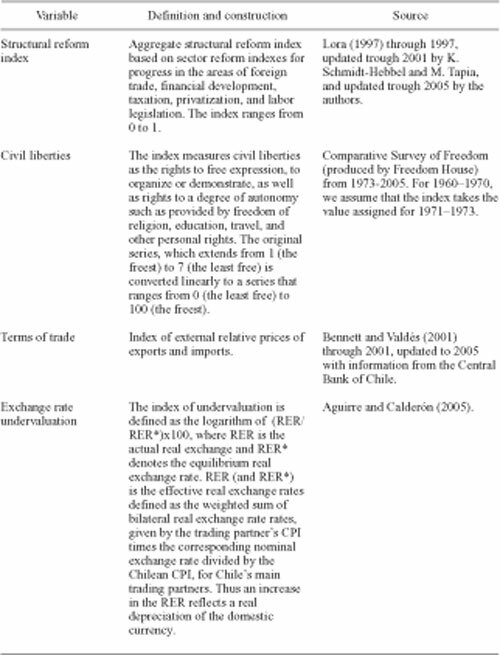 Table 9 reports the long-term parameter estimates associated with the other three independent variables: terms of trade, civil liberties and RER undervaluation. Two variables show a positive, statistically significant effect under both different specifications. However, the civil liberties index is not statistically significant. How does our model address the question of what explains the evolution of TFP? The following discussion presents an exercise in which we look at how much of the variation in TFP is explained by different right-hand-side variables. We analyze the full period (1963-2005) and the latest fourteen-year sub-period (1993-2005). The policy interaction effect was taken separately and was not added to either structural reforms nor macroeconomic stability. For the full sample period we used the steady-state version of the model results reported in Table 7, combining contemporaneous and lagged coefficients of the dependent and independent variables. Then we use the latter model, combining long-term coefficient estimates and actual average changes in independent variables between the sub-periods 1962-1965 and 2002-2005, to predict the change in the steady state value of TFP. Table 10 reports the results of the latter exercise for both TFP measures. The model based on measure 4 does a fairly good job predicting long-term TFP growth, with actual and predicted average TFP growth equal to 0.75%, while model with measure 8 over predicts the value of TFP for that period. The greater contribution of TFP in both models corresponds to structural reforms. 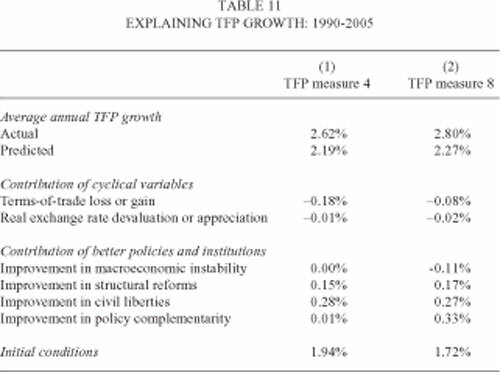 The Table also shows that the reduction in the long-term level of the terms of trade has been the most important cause of reduced TFP growth. 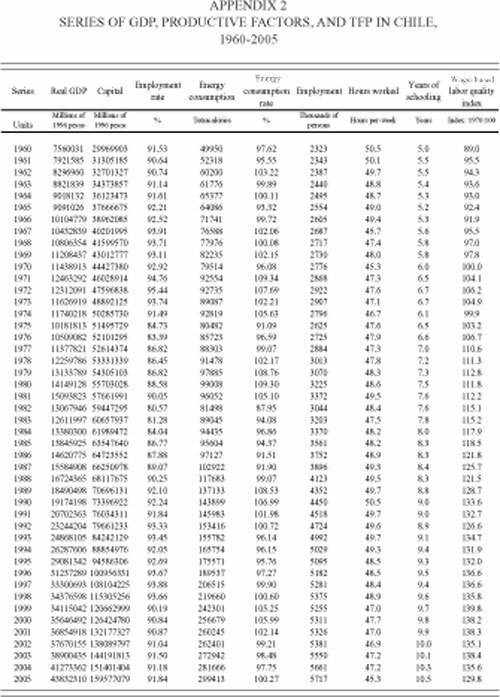 To analyze TFP growth in the 1990-2005 period, we used the short-term version of the model results reported in Table 7, based on individual coefficients for the contemporaneous and lagged coefficients of the dependent and independent variables. We use the latter model's coefficients and combine them with the actual changes in independent variables between 1989 and 2005. Results are reported in Table 11. Now the lags of the dependent variable play a very important role, reflected in figures of the last row of the table. The model again predicts TFP growth fairly well, with initial conditions providing the most important contribution. The cyclical variables, terms of trade shocks and exchange rate undervaluation, have marginal effect on TFP. On the other hand, structural reforms and civil liberties have a positive effect. Finally, macroeconomic instability had a negative direct effect on TFP, but taking into account the interaction term policy the final effect becomes positive. 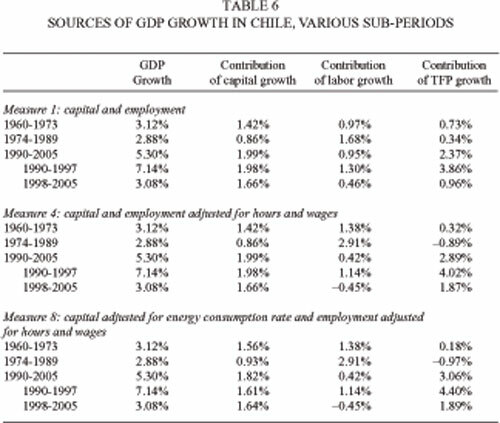 Chile has exhibited sharp cyclical and trend variation in its GDP and TFP growth rates during the last 45 years. 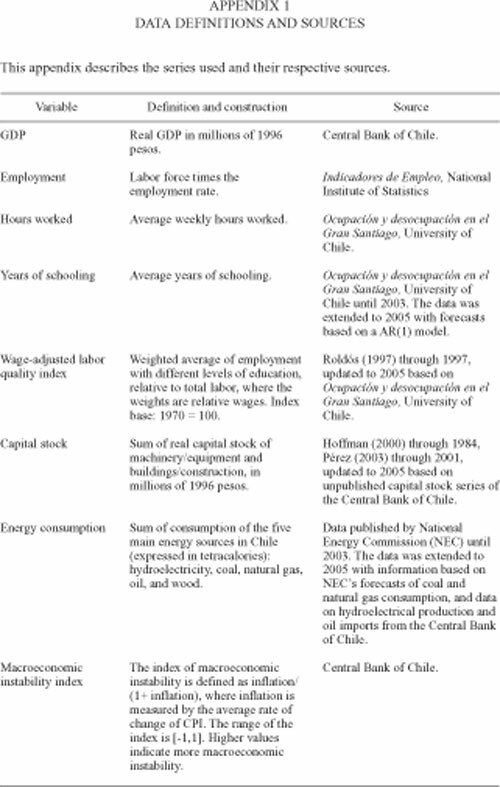 This paper contributes to Chile's empirical growth literature in two dimensions. First, we provide new estimates of the sources of Chilean growth and new measures for factor inputs and TFP during 1960-2005. Second, we focus on the behavior of TFP, providing evidence that TFP dynamics are shaped by both cyclical variables and structural policies during the last half-century in Chile. The paper reports alternative capital series: with and without adjustment for capital utilization. While for long-term capital growth it matters little if capital is adjusted for utilization, the differences between adjusted and unadjusted capital is significant over the business cycle. Among our two alternative utilization choices -labor employment rate and energy consumption rate- our preferred choice is the latter because it does not assume high complementarity between capital services and labor. Regarding labor, we also present time series with and without adjustment -in this case adjustments of labor employment are for hours worked and for labor quality (schooling or wage-based quality adjustment; our preferred choice is the latter). We use three alternative cyclical measures for GDP, based on employment-rate deviations from their sample average, and actual GDP deviations from GDP trend estimates based on the Hodrick-Prescott and Baxter-King filters. These measures suggest that the full 46-year period can be divided into three sub-periods of similar length and with similar cyclical features, separated by those years when both employment and GDP levels were close to their trend levels: 1973 and 1989. The resulting three periods -1960-1973, 1974-1989 and 1990-2005- are of similar length and roughly coincide with distinct historical eras that differ strongly in terms of international, economic, and political conditions. During 1974-1989 (1990-2005) average growth is the lowest (highest), while growth volatility is the highest (lowest). This negative relation between the first and second moment of GDP growth is consistent with international experience. 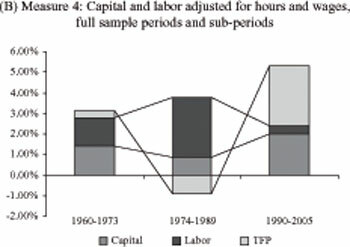 Using a standard Cobb-Douglas production function, based on alternative combinations of capital and labor measures -with and without adjustment for capital utilization, hours worked, and labor quality- we obtain eight alternative measures of the contribution of productive factors and residual TFP to Chilean growth. The contribution of factor accumulation and efficiency gains to growth differs markedly across the three periods that were identified above. Whereas the contribution of capital is dominant during the 1961-1973 period of modest growth, labor contributes the most and efficiency gains the least to growth during the slow-growth period spanned from 1974 to 1989. In contrast to the three preceding decades, all three growth determinants contribute more during the high-growth period of 1990-2005. However, the large role of TFP growth stands out in this period, contributing aggregate growth by an amount that is unprecedented in Chile's recent economic history. The high-growth period can be divided into two distinct sub-periods: a period of high GDP and TFP growth in 1990-1997 and a period of moderate GDP growth and low TFP growth in 1998-2005. And the latter sub-period hides very distinct shorter time spans that mark a full business cycle with common GDP and TFP performance: a sharp cyclical contraction in 1998-1999, a slow cyclical recovery in 2000-2003, and a strong recovery toward full employment in 2004-2005. 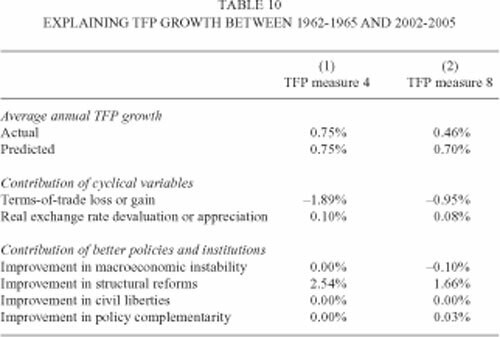 The evidence on the determinants of TFP reported in this paper suggests that, in addition to cyclical factors (approximated by the terms of trade and real exchange rate undervaluation), TFP growth reflects efficiency gains from macroeconomic stabilization (measured by lower inflation) and microeconomic reforms (reflected by an index of structural reform progress). We also provide evidence on significant interaction effects between macroeconomic and microeconomic factors for the dynamic behavior of TFP. The evidence for Chile during 1960-2005 suggests that the impact of microeconomic reforms on TFP is weaker (stronger) under conditions of high (low) macroeconomic instability. The reverse is also true: macroeconomic stabilization efforts yield larger gains in economic efficiency when the quality of microeconomic policies is higher. Our evidence also points out that a significant factor behind higher TFP growth in 2004-2005 has been benefiting from exceptionally favorable terms of trade (i.e., exceptionally high copper prices). This suggests dominance of cyclical over structural factors in the most recent spurt in TFP performance. Macroeconomic stability has been largely attained in Chile, and hence it can be ruled out as a significant future growth factor. Therefore we conclude that achieving high TFP and GDP trend growth in the future will be conditional on significant additional efforts in implementing further microeconomic and sector reforms in support of additional efficiency gains and major improvements in labor quality. *We thank Vittorio Corbo, Alejandro Fernández, Juan Pablo Medina, seminar participants at the Central Bank of Chile and two anonymous referees for helpful comments and suggestions. This article reflects the view of its authors and does not necessarily represent those of the Central Bank of Chile or its Board members. 1While it is possible to separate the components of growth into factor accumulation and efficiency, this does not mean that they are unrelated. When TFP increases, the demand for productive factors tends to rise, leading to higher accumulation. 2Recent empirical studies on Chile's growth include De Gregorio (1997), Rojas, López, and Jiménez (1997), Roldós (1997), Coeymans (1999), Bergoeing, Kehoe, Kehoe and Soto (2002), Beyer and Vergara (2002), Contreras and García (2002), Gallego and Loayza (2002), Solimano and Soto (2003) and Chumacero and Fuentes (2006). 3The selected sub-periods are those in which the cyclical measures are on average close to zero. However, these same periods might not appear to be the most adequate if we take the measures individually. For example, for the 1960-73 period, the cyclical measure based on the HP filter starts below zero, hence our 1960-1973 growth measure includes a slight cyclical recovery component. 4For reasons of space, we refrain from reporting all the possible combinations of alternative measures of capital and labor. We include only those that we consider the most representative. For instance, we do not show results obtained using capital adjusted for the utilization rate proxied by the employment rate, because the latter assumes strong complementarity of capital and labor during the cycle. Similarly, we do not report the results based on employment adjusted for years of schooling, because we consider more appropriate the quality index based on wages. 5Harberger (1998) considers TFP variations as cost reductions -that is, as efficiency gains or technological changes. 6The simple correlations between the terms of trade and the two measures of the cyclical component of GDP reported above, based on the Hodrick-Prescott and Baxter-King filters, are close to 0.5 in the 1960-2005 period. Similarly, the correlations between the real exchange rate undervaluation and the two measures of business cycles are close to -0.5. One might argue that the exchange rate undervaluation is an endogenous variable given that it responds to the evolution of productivity; however, lagged values of such variable where always significant in explaining TFP in our subsequent analysis. 7Using volatility of inflation instead of its mean does not make much difference, since mean and volatility are highly correlated (the coefficient of correlation between both series is 0.9). Moreover, the growth literature usually uses the mean of inflation as regressor in growth equations (e.g. Fischer 1993). 8RER undervaluation is an index constructed as the ratio of observed RER to the equilibrium RER times 100. The variable used is the log of this index, which fluctuates around the ln (100), which is the value of the index when the RER is equal to its equilibrium level.